Makepung is very famous in Jembrana, Bali Indonesia. Makepung is buffalo race in Jembrana which uses a pair of buffalo pulling a small wagon ridden by a jockey. This race still exists to this day, and became a gambling under the guise of art and tradition. Makepung actually is a gambling event conducted by the owner of the buffalo, as well as a platform to raise the price of buffalo that had been won in the race. 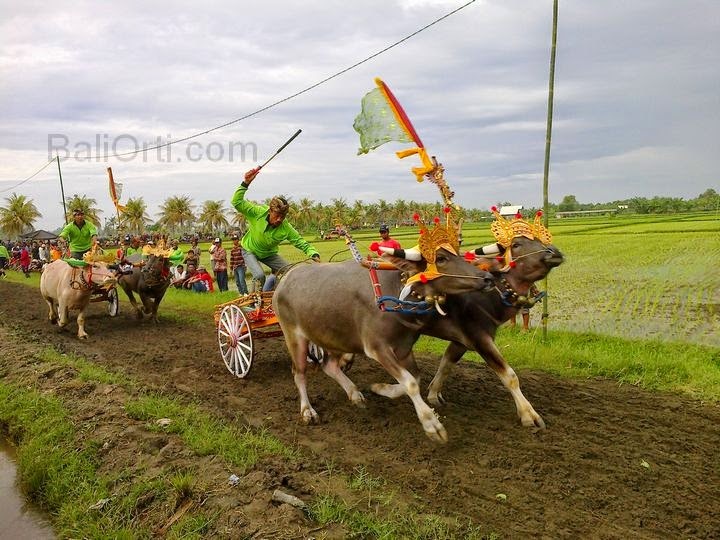 Buffalo race is only in Jembrana in West Bali. Read: Buffalo racing in Jembrana is a gamble. Buffalo race in Jembrana (Makepung) by the local government is considered as a unique tradition that should be preserved its existence. Fact has been recognized as a National Cultural Heritage of Indonesia by the Indonesian government. So that this event should be preserved its existence. The efforts made by the government to preserve this event held game pioneered by the local government with the trophy and money for coaching. But there is a downside that is not known by the layman about Makepung, buffalo racing very well known. Indeed, this race is a showcase of torture against buffalo. Therefore, buffalo forced to run as fast as possible by means of torture buffalo to hurt him using the whip from wood. Whip used to hit the buffalo is very terrible. The whip is made from wood filled with sharp spikes at the edges. The nails are in plug at the end of the whip from wood. The spikes are lined meet whip end. If the whip on the skin, the skin will be hurt. In fact buffalo skin will be hurt if hit by the whip. When the race starts, a pair of buffalo that pulls the train with a jockey, jockey hit with a whip from wood buffalo containing sharp spikes. The nails are wounded buffalo backs bleed very much. Buffalo ran for pain, not because of passion and love. Buffalo running because the pain of the prod from a nail. The government plans to make buffalo race as a tourist attraction to attract tourists to visit Jembrana. The government plans to make regular agenda related to the implementation schedule buffalo race in Jembrana. Each week fans buffalo races regularly held races and training. In each sub-district there is a race track, this track is provided by the local government. Not everyone likes to watch buffalo race in Jembrana (Makepung). Because the race is a race that torture buffalo buffalo. When the buffalo ran into the track, hit the bulls on the back. Was hit as hard as possible to pain. Whereas on the back of the buffalo is the spine. If the affected nail, it is certain that the buffalo would be in pain. Ironically, the bulls who took part in the race every week will do the race. So every week the bulls get a pain that makes buffalo suffer. So Makepung is gambling activities, which tortured buffalo.